Me, my sister and my grandmère set off for school one morning. Grandmère was driving us, as she was out from Mauritius visiting for a couple of months. Suddenly a big 8 legged friend walked up the windscreen (on the outside) and within seconds on a major road in Sydney, we’d pulled over, and all got out of the car and grandmère walked us to the bus stop and to school. So irrational was her fear of huntsman spiders, that she left mum’s car with the ignition on and key most definitely in, abandoned. Mum retrieved it later, still there thank goodness and the spider was later found and removed. Guess who took that experience on and adopted the fear as my own? I’ve worn my husbands clothes out in public, straight from the wash basked, because there was a huntsman in our bedroom. I’ve sent my lap top flying across the room and a hot peppermint tea across my leg, because there was a huntsman in the living room. I’ve flee’d my apartment at 2am to sleep at then boyfriend, now husband’s house, unable to deal with the furry creature. I’ve knocked on my neighbour’s door at 12.30AM, because there was a huntsman. I’ve woken my little sister at 3am back in the day, because there was a hunstman OUTSIDE my bedroom. Outside. Not even in! Paralysed, irrational, unable to think anything through, these days as soon as the weather’s warm, I look out for huntsmans. Every corner of every room as I enter it. Eyes darting about. Shadows explored. Baby ones disposed of while I can still cope with them in size. Poor things. Windows preferably closed to point of heat suffocation, rather than the thought that one might get it. You might think I’m exaggerating. Sadly, I’m not. I don’t have the fear with any other spider type. It’s a specific, obsessive fear. Why on earth go on about this to you? Because recently I said to myself: NO MORE! This is a block existing in my life, that I am ready to out grow. This was my grandmère’s fear, NOT mine. This is something that causes low level anxiety and often crazy adrenal stress for several months in the year and that is not a good thing to carry around for my health! So, in the morning, I will be working with a top practitioner referred to me by the lovely Amy over at The Holistic Ingredient, to clear the fear. It is said she never failed. I am ready to be an “i’ll just grab a jar to pop him into, so we can put him outside” person. I’m excited for what it might mean to let go of this fear. What are you scared of? Fancy challenging yourself to work on it? This stuff is not good to carry around, so come join me and let your fears go! I know how fearless you are on the inside! I’m fearful of snakes. I can’t even look at a photograph of them. During my walks through the Merri creek (known to have snakes) my eyes dart around to make sure there isn’t one slithering onto the path. I also hesitate to walk through long in maintained grass. When I do find myself thinking about them, I try to fill my mind with positive thoughts. During my walks when I get anxious I stomp because apparently the sound keeps them away. 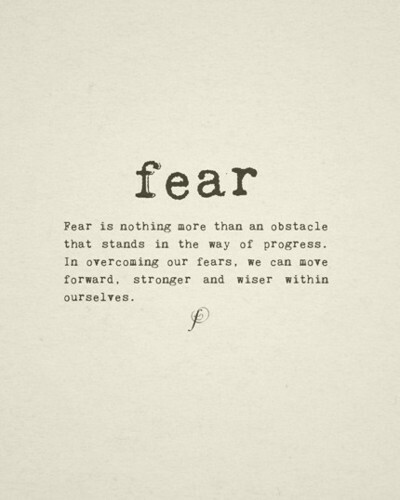 Love it, when my fears present themselves which at times is often with my anxiety.